Today was Buckeye’s day. A lot had happened to him by 9:00 am. 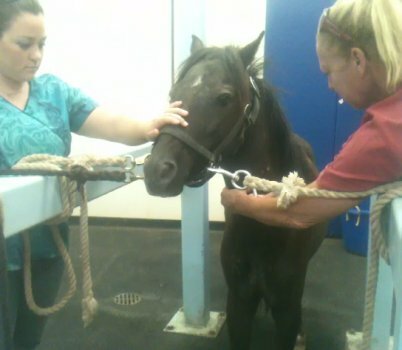 He had been given a bath, the first in a very long, his leg had been cleaned and shaved for preparation for surgery. Now he was ready for the life giving surgery, thanks to you! Soon he was in the operating room. He was given the drugs to make him go into la-la land. 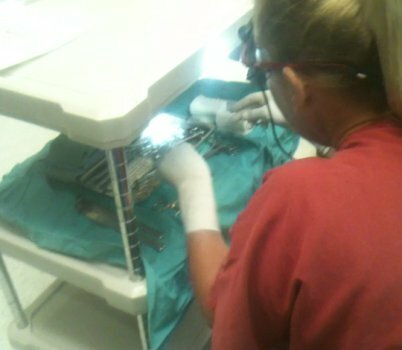 Then his leg was cleaned again to make everything sterile. Here you can see how to the right is the flat area where he should be standing. 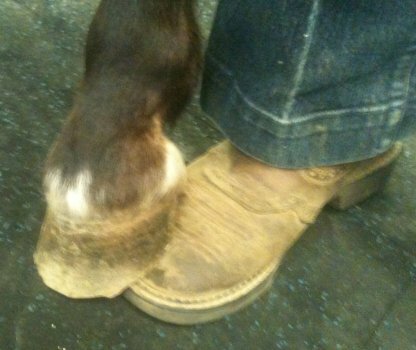 He is actually standing on the front of his hoof. Dr Weaver made sure all of her surgery tools were in order. 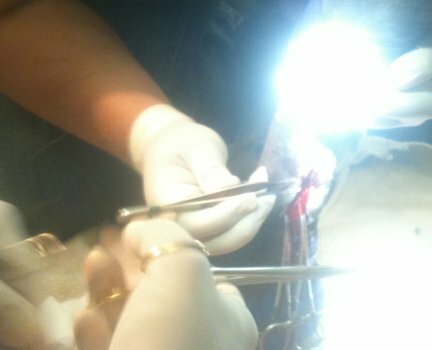 Then the surgery began. At times everyone held their breath, finally the tendon was reached and was cut to relieve the contraction. Tawnee stood behind him helping to support him in his sleepy state. You have heard of people holding hands during surgery and stressful situations, well, Buckeye wanted to hold hands too! 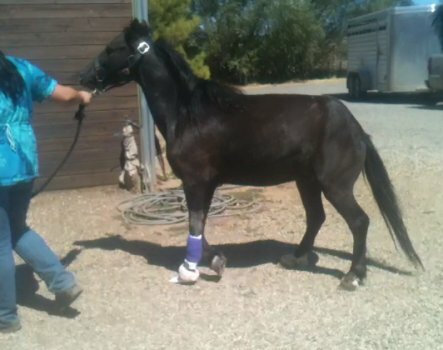 He gently put his back hoof on Tawnee’s foot as the surgery went on. He wanted emotional support. Finally the surgery was finished. Everyone could see a huge improvement already. 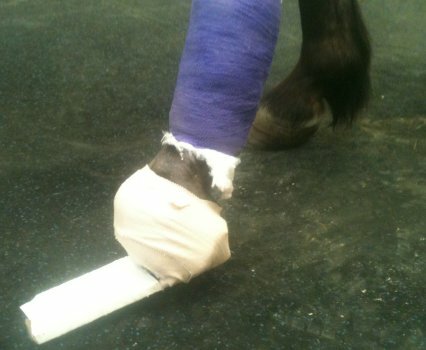 The farrier will be coming out and making a special shoe that will help him walk on his heel, helping his rehab progress nicely. He was such a good boy through the whole surgery and didn’t feel any pain through it all. He knew that they were helping him. He was a little confused about his new standing position on that foot, but with time it will come as second nature. Soon he was led out to a waiting stall and got to take his first steps properly in his whole life. Soon he was in the stall enjoying some nice yummy food. We would like to thank you once again for giving Buckeye the gift of life. It will be a long rehab, but we know he is on the right path now. This operation could not be done without your support, and we thank you for your promptness in completing the fundraising goal so he could get the surgery he needed to relieve his pain sooner than later. Many thanks to Gail G. for her steady monthly support. Please consider becoming a monthly sponsor, it is very easy. 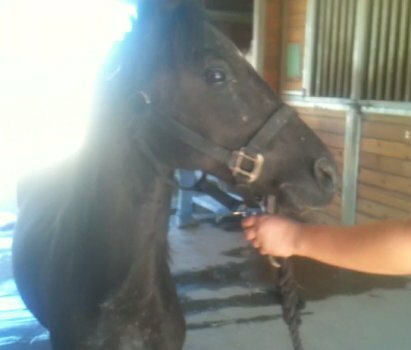 Be the horses hero, click here. This whole surgery was un necessary. He is in more pain now than he was before and I feel worse for him now than I did before. Look at his body posture bofore and after. He is not walking better at all. 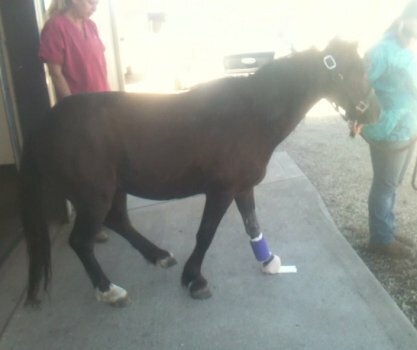 All he needed is correct hoof care and physical therapy. There was no need to sever his tendons. Tendons cannot contract to the extent it would “pull” his foot backwards. Tendons attach bone to muscle. If anything is contracted it would be his shoulder muscles. Tendons cannot contract to that extent. The whole problem came about because the back of his foot hurt and to avoid that he began walking on his toe until his heel got so high he “knuckled over”. 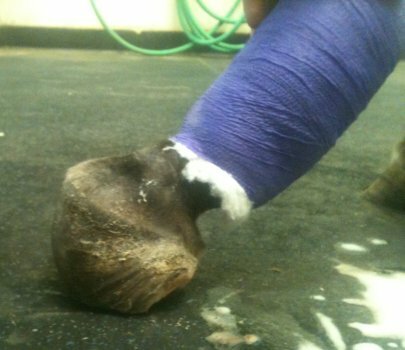 Then his toe wall grew backwards and under his entire hoof capsule. 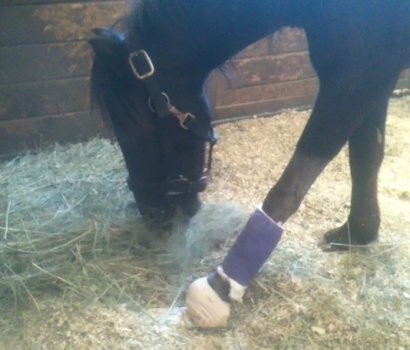 Now he has to try to recover his mutilated foot, his sore body and from his tendon being severd, which will take years, as they are a fiborus tissue that receives little blood flow so healing will be a very long and painful process. And, a special shoe is not going to help him. But, good luck with all that. I feel very bad for the pony. 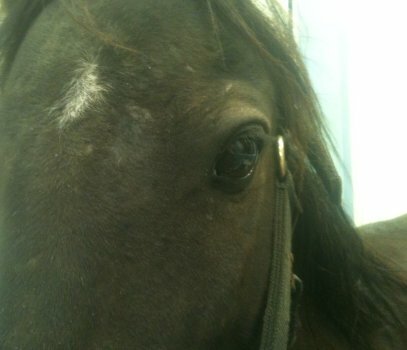 He would have been better off being euthanized like the little Marylegs white pony you recently put down. 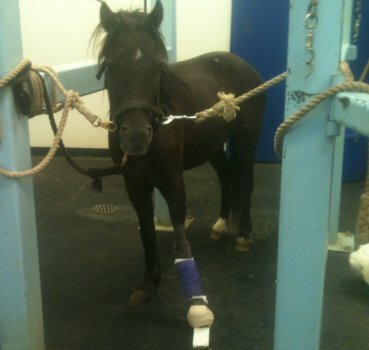 That pony could have also been fine if she had correct hoof care and rehabilitation. 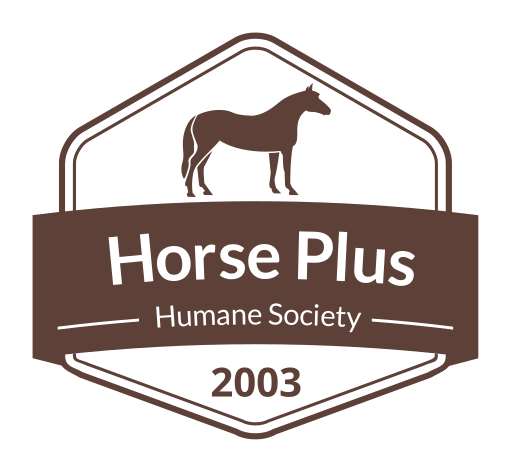 I wish people were more correctly informed on the functions of a horses body and the effects we have on them, especially if one is going to run a horse “rescue”. I wish you luck. 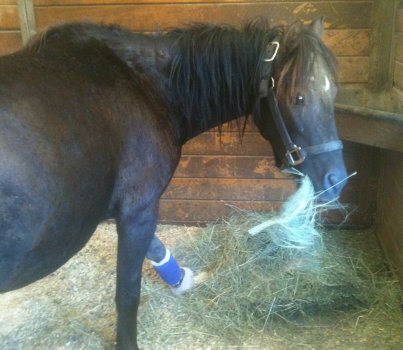 I guess you know more than the veterinarian that performed the surgery and the farrier. The folks at NorCal did not do this procedure on their own in a back alley.